In my review of Shugo Tokumaru’s excellent album Exit, I talked about my propensity towards geographical isolationism as it applies to the music I listen to. That means I tend to stick to the USA, Canada, and UK, rarely venturing much further than these English speaking hot spots for musical sustenance. The obvious reason behind this is that, like many Americans, I only speak one language. I took Latin in high school and Spanish in college, but never became fluent in either (who becomes fluent in Latin these days, anyway? The pope?). However, I have a fairly good grasp of the Spanish language, and while I can’t speak it, I can usually read it pretty well and understand it somewhat when I hear it spoken or sung. This passing familiarity with the Spanish language has occasionally given me the courage to wander outside of my self-imposed geographical boundaries to seek out different sounds. As mentioned in the above referenced review, one band that I really love is the now defunct Argentine band Soda Stereo. There have been many other Spanish language acts that have at least briefly held my attention, such as local Austin band Grupo Fantasma, Latin/hippie/hip-hop fusion band Ozomatli, and, of course, Menudo (not really). It was in researching Atlanta garage rock band the Black Lips, however, that I learned of a group that has challenged Soda Stereo as my favorite Latin rock band. Heavily influencing the sounds of today’s lo-fi garage revivalists like the Black Lips, Los Saicos were a Peruvian garage rock band that formed in 1964. 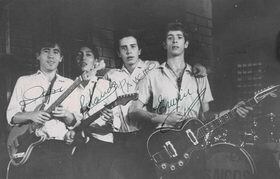 During their short two year existence, Los Saicos swept through Peru, becoming the most popular act in the country and starring in their own TV show in 1965 before completely dropping out of sight the following year. They released just six singles during their brief career. According to the band, they felt their popularity on the decline and decided to completely walk away from the spotlight. They left behind a major influence on the Latin American music scene, and they have been cited as huge influences on Latin rock and punk. In a time when other South American rock bands were just imitating the sounds coming out of America and the UK, Los Saicos burst onto the scene with their own manic, angry, anarchistic viewpoint and created a sound all their own. A documentary about the band, cleverly titled Saicomania, is set for release in 2009. This entry was posted on Friday, April 3rd, 2009 at 1:18 PM and is filed under Filler. You can follow any responses to this entry through the RSS 2.0 feed. Both comments and pings are currently closed. hi, i’m peruvian and this reminds me of my music classes in middle school. we had two very conservative teachers that used to tell us about a band from their youth that sang a song that only talked about tearing down train stations (and they even repeated the “a-ta-ta-ta-ta-yayaya” part) and how that was not real music! only years later i would discover that it was the saicos… and that they were awesome! Los Saicos are indeed the most original and pure rock and roll act Latin America has ever produced. While everybody else (even today) brings what was already played in the US and the UK the year before, Saicos created some killing songs with a sound never heard before in the whole planet.